Bringing excellent interior architecture to life. Outdoors is the new indoors for HI-MACS®. LG Hausys sets new trends in Quality: Discover the new Structura and our Indoor and Outdoor Products! Magnificent colours bring excellent interior architecture to life. For many years, different shades of white have dominated, brought to life by adding attractive feature colours, and with the skilful blending of different shades and materials. More and more architects and builders are using the material for outdoor furniture or outside façade designs. The result: expansive, virtually seamless surfaces and an attractive visual style emanating from the linear or curved contours. The next dimension in texture design: HI-MACS Structura®. The HI-MACS Structura® surfaces have a 3D textured appearance and can be used in interior design, as well as outdoors, for instance as the cladding for a façade. Outstanding features abound. A compelling material. Explore the features and benefits of HI-MACS® design, quality, fabrication and sustainability. Bringing excellent design to life. An outstanding material with outstanding features. Fabrication guidelines to achieve perfect results. Because our environment and your health is worth it. Every option is available to designers to create neat washrooms, kitchens, hospitals and much more with our wide range of HI-MACS® sinks and bowls. Perfectly coordinated and ideal for mixing and matching, the bowls and sinks guarantee a modern look that is easy ad simple to look after. Certain colours and thicknesses of HI-MACS® exhibit a special translucency when exposed to light. Various textures and patterns can be built into the material to intensify the HI-MACS® translucency effect. HI-MACS® boasts a simple heating process and three-dimensional thermoplastic forming capabilities. 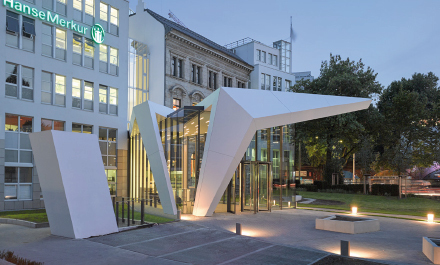 This allows for greater forming flexibility compared with other conventional materials so that spectacular ideas can quickly take on a concrete shape. 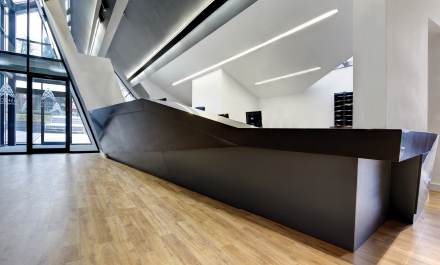 HI-MACS® offers a virtually limitless range of colours in all conceivable shades. More are being added every year no matter what colour you choose, HI-MACS® remains 100% homogeneous. Stronger surface with durability similar to that of natural stone - HI-MACS® stands up to everyday scratches. Should you accidentally inflict a deeper scratch or surface impression, a trained professional can easily resurface your HI-MACS® thanks to its sealant-free consistency. Backed up with numerous certificates that attest of its fire resistance, HI-MACS® is ideal for places where security is the number 1 criteria of choice. The material is heated in a progressive tempering process (Thermal Cure). which sets HI-MACS® apart from other mineral materials and produces a new and stronger compound in which any structural defects are perfectly evened out. This improved structure automatically affects the quality of the material. Although HI-MACS® is almost as robust as stone, it can be worked in the same way as wood. Using conventional carpenter's tools, this solid surface material can be sawn, routed or drilled. HI-MACS® allows for visually seamless manipulation. Smooth integration enables large areas without joints or edges as well as flush mounting of sinks or bowls. With easy-to-care and repairable properties, no matter if it's a scratch, stain or crack, HI-MACS® can be restored to its original state by a certified professional. HI-MACS® supports greener earth by using sustainable material, eco-friendly manufacturing process and recycling at the end of its life-cycle. LG Hausys fully stands behind HI-MACS® quality, which is we offer a 15 year transferable warranty with customer's best interest in mind. Questions? Please feel free to contact us for further information. We are convinced that you will see that quality is key in our DNA. Here we show you how this way of thinking influences the way you fabricate the material in your workshop. In these four short videos you can see some of the essential aspects of working with the material of endless possibilities. Because Quality wins! The exclusive 15-year warranty with a Quality Club fabricator ensures that your satisfaction is guaranteed. Numerous certificates award HI-MACS® top marks. The best quality because our environment is worth it.